Mala tempora currunt (bad times are upon us), wrote Italian wine writer Franco Ziliani yesterday in an email, one of the tide of messages that pulsed across the internets as we all tried to make sense of the unfathomable: on Sunday night, someone entered the cellars of Gianfranco Soldera (left, photo taken during my visit in 2008) and destroyed more than 60,000 liters of his wines, six entire vintages, spanning 2007 (still in cask) through 2012. According to a post today by the Consorzio del Vino Brunello di Montalcino (Brunello producers association), “62,600 liters” were destroyed and the site confirms that “the entire production from 2007-2012” was lost. 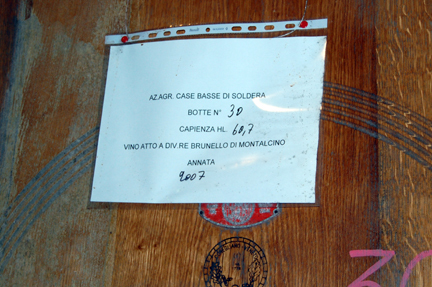 When reached for comment by the authors of the post, Soldera’s son Mauro told them that the wine was insured, including coverage for vandalism (before becoming a winemaker, Gianfranco Soldera made his fortune in the insurance trade in Milan). I wasn’t able to reach Soldera winery for comment today (the landline was occupied every time I called and a call to Gianfranco’s cellphone went unanswered). But I did speak to a number of people “on the ground” who concurred that the involvement of organized crime is unlikely. Most believe that the senseless act was inspired by vengeance, perhaps in retribution for the supposed (but never verified) letter that Soldera wrote to authorities who launched an investigation into adulterated wines in Montalcino, an episode that culminated with judiciary action against a number of major players in Brunello in 2008 (the so-called “Brunellopoli” or Brunellogate affair). Above: Photo taken in 2008 during a visit to the winery. Yesterday, when we spoke, wine merchant Ceri Smith told me that she had tasted the 2007 in cask when she visited Soldera in February of this year. One person I spoke to this morning (afternoon in Montalcino) proposed that it might have been a disgruntled ex-employee of Soldera. But everyone I spoke to agreed that it’s unlikely that organized crime was the author of the vandalism. 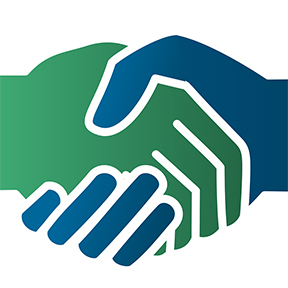 There has been no mafia activity there, said one informed person, and it is improbable that such an event would be isolated if the malavita were involved. 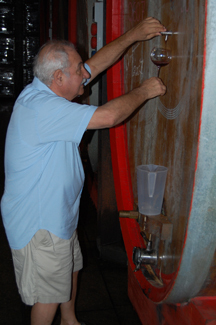 In a phone conversation today, one of my friends in Tuscany noted how easy it would be to empty the casks of their wine. If you’ve ever visited a winery where large format casks like Soldera’s are used, you know that it’s simply a matter of opening a valve (if the wine were aged in 225-liter barriques, for example, this egregious task would be much more complicated). 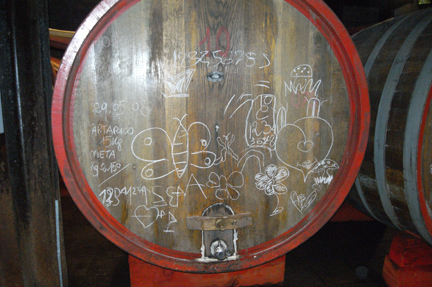 Above: “I let my grandchildren use chalk to draw on the casks,” said Soldera during my 2008 visit. Note the spigot at the bottom of the cask. As hard as it is to wrap our minds around this nefarious and senseless episode, it’s easy to imagine how simple it would be to execute the crime. When Tracie P and I stay in Montalcino, we regularly leave our keys in the rental car and the doors to our apartment unlocked. Italy has a long history of vengeance, spanning ancient Rome, the Renaissance, and the twentieth-century, when many towns and families were torn apart by the brutality of fascism, the extreme violence of organized crime, and the envies and jealousies borne out by the gap between those who prospered in Italy’s post-war economic miracle and those who didn’t. The English word vendetta, indeed, comes from the Italian (from the Latin vindicta, meaning vengeance). Today, faced with the thought that no fewer than six vintages of one of the world’s greatest wines have been lost, no one among us has an explanation for the incomprehensible violation of — what we must recognize as — one of Italy’s greatest treasures and one of the most noble expressions of its cultural legacy. United in our bewilderment, we can only express our solidarity for a man who has lost six precious years of his life.